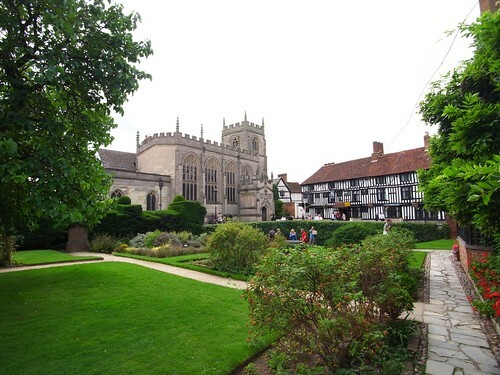 This post features the Guild Chapel in Stratford, one of many fine old buildings in the town. It is situated next door to Shakespeare’s last house ‘New Place’ on the corner of Chapel lane and Church street. The Guild Chapel dates from 1269 when the Bishop of Worcester allowed the establishment of a Chapel and hospital. In the following centuries the Guild of the Holy Cross grew in size and influence, becoming a significant landowner in the town of Stratford and attracting many followers. The chapel took on much of its present form in the 1490’s when an ex-resident paid for extensive re-building. Hugh Clopton was born in Clopton near Stratford in about 1440, he was apprenticed as a mercer in London in 1456 and by 1491 he had achieved the position of Mayor of London. Despite his success he never forgot his roots in Stratford and he was responsible for building New Place which was purchased by Shakespeare in 1597. 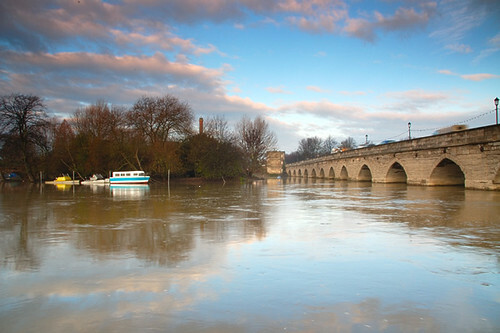 He is also credited with building Stratfords stone bridge over the Avon which still bears his name. Clopton funded extensive development of the Guild Chapel in the 1490’s when the tower and nave were built and the wall paintings were competed. Prior to the reformation, Church interiors in England would have looked quite different to those we see today, being full of colour and religious drama. Ordinary people were active in the maintenance and management of the Church and reading about these times one gets a feeling that this was an important part of community life. The Guild Chapel would have been no different – imagine how it would have looked when brightly painted with coloured images of saints favoured by the local people. The most impressive painting was above the chancel arch – this showed a picture of doom with its vivid images of heaven and of sinners falling into hell. This account from Simon Schama’s history of Britain gives a good idea of how many churches would have changed at this time. In 1573 the Guild Chapel was attacked , many of the Statues were smashed ( is this where the expression to ‘de-face’ originated?) and the wall paintings were painted over. In churches throughout England, religious wall paintings were being replaced by the Queens coat of arms, ones loyalties in future were expected to be directed towards the Tudor State. William Shakespeare was aged 9 at the time the Chapel was defaced, one wonders how his family who were surely familiar with the Chapel, must have felt about the changes being imposed upon it. As mentioned at the top of the post, the Chapel is well worth a visit today. Although the ravages of past neglect are still apparent, one can easily make out the outlines and colours of many of the original wall paintings. With a little imagination it is possible to get a feel for how things used to be (Nash’s House – next to New place contains illustrations of how the chapel would have looked). I have added some pictures to the post so that you can get an idea of what it is like here. It is possible to see the outlines of figures and to make out faces still vaguely present on the walls. If you want to see more about the chapel then there are some links below – if you visit then do remember to add a donation to the Chapel funds and help to preserve this for future visitors. I am keen to find more defaced images – if you know of any, please let me know. It was the day after Boxing Day, the sales were on and Town centres were stuffed with shoppers. Desperate to get out and about whilst avoiding the crowds and the sales I decided to take a walk around Stratford. Whilst the Town has its share of shopping centres I guessed that the old part might be a bit quieter. Stratford is a popular place and attracts many visitors from across the world. Despite this it (usually) doesn’t feel too overcrowded. Over the years Stratford has managed to quietly accomodate its many visitors. It is possible to be here on a busy day and still feel that you can have a pleasant day out. 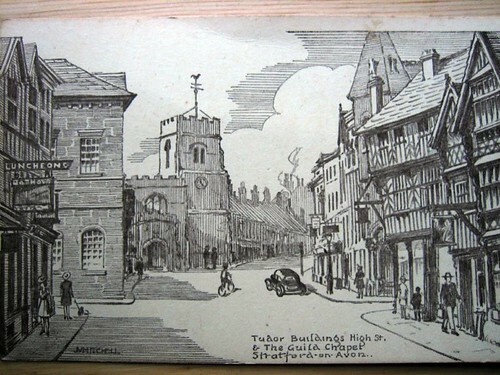 Many buildings remain that would have been recognisable in Shakespeare’s day and usually these have been well cared for. The RSC is progressing well with the rebuilding of the theatre, last time I was here it was a building site but now the outlines of the new theatre can be seen clearly. Frankly, the old theatre was not a great place to watch a play. I much preferred the Courtyard theatre where the audience surrounded the stage and were not kept at a distance like they were down the road. I am looking forward to seeing the finished theatre which seems to be an attempt to address some of these problems. The building currently being replaced was built in 1932 as a replacement for the original theatre which burnt down in 1926 – I found an old photo of this which is reproduced below. This link contains some other photographs of this building, interestingly the stage was a lot closer to the audience in the old building. This is the one building that everyone who comes to Stratford wants to see. It sits in Henley Street, a fairly unremarkable road that has changed greatly since Shakespeare’s day. The house gets a bit crowded on busy days and the new visitor centre (to the left of the photo below) is a bit of a monstrosity – you can tell that others agree by doing a search on Flickr – notice that people (usually) choose to take or to crop the photo so this doesn’t show up! Finally, I took a walk by the side of the Avon,past the Dirty Duck pub and the Courtyard Theatre and stopped at Holy Trinity Church, Shakespeares burial place. This blog has covered various aspects of Catholic persecution during the Elizabethan and early Stuart period. Many of the characters involved are well known to us and would have been recognised as ‘players’ in the struggle between the authorities and the Catholic underground movement. People such as John Gerard, Henry Garnet and Richard Topcliffe were well known figures of the day, however, for the most part, the supporting players are forgotten. This post looks at Nicholas Owen, who despite spending his time in the background, nevertheless managed to play a vital part in preserving the Catholic faith in England. Nicholas Owen was born in St Peter le Bailey in Oxford. His father, Walter Owen was a carpenter and Nicholas followed him into this trade when he was apprenticed for a period of 8 years on February 2nd 1577. Oxford at this time was a centre of Catholic recusancy and it is clear that Catholicism was a strong influence onthe Owen family. Nicholas had three brothers, two of whom became Priests and one who was known as a printer of secret Catholic pamphlets and religious materials. In 1588 Nicholas was engaged as a manservant by Henry Garnet (see earlier post) who was at that time the Jesuit superior in England. Garnet employed Nicholas’ carpentry and building skills in the service of the recusant Catholic movement. 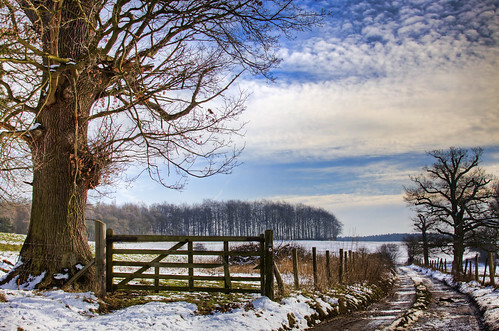 Today, England contains around about a hundred houses which have a secret hiding place. Many of these are of a simpler design i.e. a hole in the floor leading to a space below, usually within a wall. The hide entrance is covered by a hatch which would have been hidden with reeds and rushes typically used to cover floors during this period. Harvington Hall has two such hides and a similar hide at Moseley Old Hall was used to conceal Charles the Second after the defeat and flight from Worcester in 1651. Unlike the simple (and predictable design) of the older hides, Nicholas Owen’s constructions are recognised because of the ingenuity of their construction. Although it is possible to question the accuracy of Feas work ( hide builders didn’t generally make subterreanean passages for example) the ingenuity of Owens work cannot be questioned. Nicholas Owens hides were always different, discovering one in a house would not help a searcher to find a hide in another house. Often ceilings and floors were raising or lowered and hides were concealed in roof spaces, behind panelling and walls, in or below false fireplaces. Owen worked alone and despite his small stature (hence the nickname ‘little John’) he must have been a really powerful man. Creation of the hides involved cutting through walls, floors and wooden beams. Nicholas Owens work helped to save lives onmore than one occasion (see example) and he was probably also involved in a spectacular escape from the Tower of London. His knowledge of the Catholic underground movement must have been vast – he was a prize catch for the authorities and the fact that he died (see link to earlier post) rather than reveal his secrets helped to elevate him to heroic status among his peers and amongst people ever since. Nicholas Owen was canonised in 1970 – he has a church named after him in Lancaster. 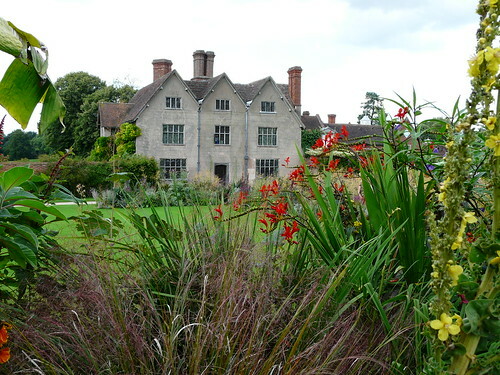 Also, I have linked to this film before but if you haven’t seen it I thought you might want to take a look, it gives some background to Nicholas Owen’s work at Harvington Hall. The English Midlands is blessed with a very rich selection of Tudor period houses, indeed, these have been the inspiration for many of the posts on Tudor stuff. 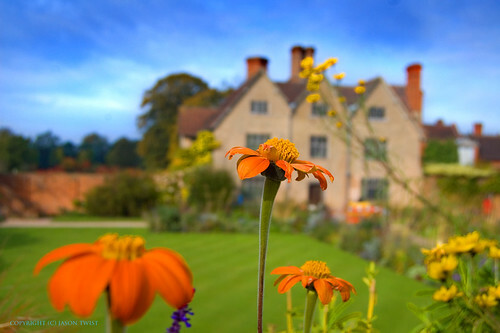 I have been meaning for quite some time to do a post about one of my favourite local places, therefore, this post is about Packwood House, a National Trust property just outside Solihull. Packwood House dates from the 1550’s although like many houses of this age it has been extensively altered over years. In some parts of the interior one can clearly see it’s Tudor origins, whilst other parts appear designed to evoke ‘Mediaeval’ type surroundings. Apparently, many parts of the house were deliberately re-modelled during the 1930’s to create this effect. 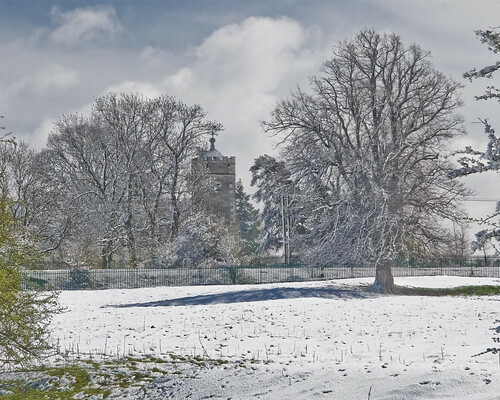 In the past, the English Midlands was a major centre of Catholic recusant resistance, many of the Gunpowder plotters came from or were supported here. 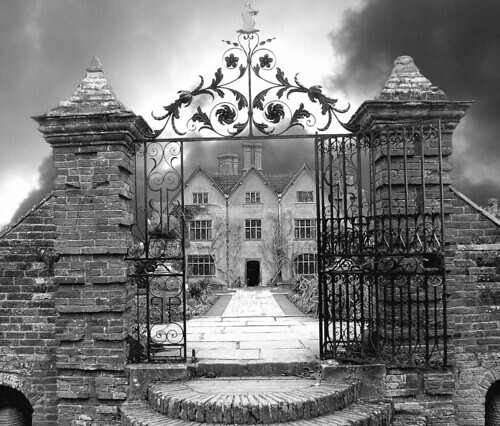 However, unusually for a local house of this period, the family don’t seem to have been covert Catholics, as for example the occupants of nearby Baddesley Clinton, Coughton Court or Harvington Hall most certainly were. There are no hidden priest holes and no history of sheltering Catholic Priests – the house can claim that General Henry Ireton slept here the night before taking part in the battle of Edgehill. There is also a story that King Charles the second stopped here briefly after leading his forces to defeat at the battle of Worcester in 1651. 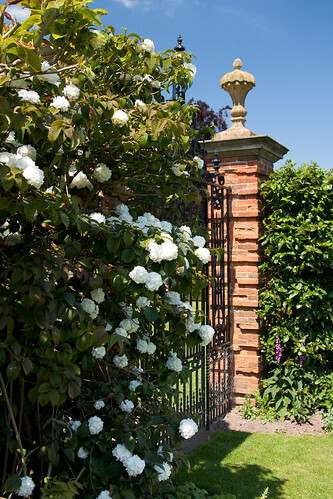 For me, a big part of the appeal of this house lies in the grounds, at some times of the year the gardens are absolutely stunning – and it is clear that a great deal of work and planning goes into maintaining these. 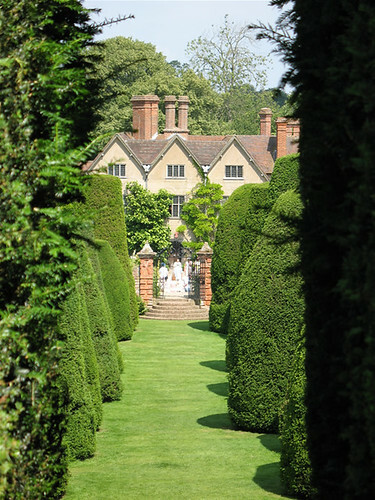 One of the most distinctive features of the garden is the yew topiary which is said to be based upon the sermon on the mount. 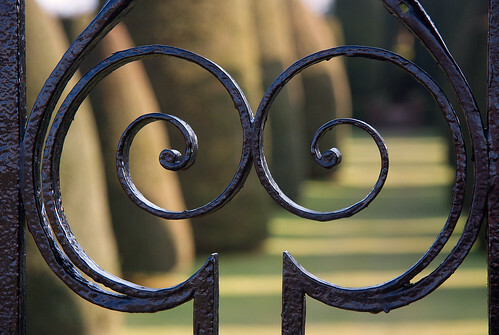 There are over a hundred Yew trees which make up a maze like formal arrangement which leads up to a spiral walkway through a hedge into a hidden seating area at the bottom of the garden. Although history has much to say about king Henry VIII there was relatively little interest in him as a child. Although Henry was one of six other children, only four lived to adulthood, Henry himself, two sisters, Margaret and Mary and Henry’s older brother, Arthur. Arthur was born in 1486 (only one year after his fathers victory at Bosworth) in Winchester and was named after King Arthur. 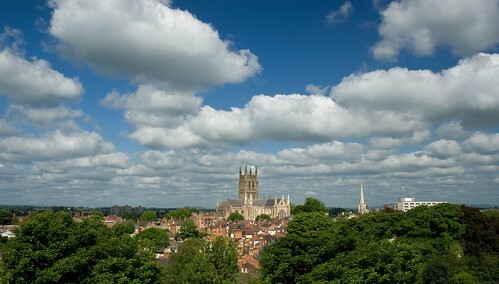 His birthplace was chosen specifically for its connection to King Arthur, at the time, Winchester was believed to be the historical site of Arthur’s court, Camelot. Henry VII was always aware that his claim to the throne was quite a weak one, it was his intention that associating his son with King Arthur would help to re-enforce his position. As part of a further attempt to ensure his position, Henry VII arranged a marriage between his son and the Spanish princess, Catherine of Aragon. Catherine arrived in England in 1501 and the couple were married in St Paul’s cathedral. 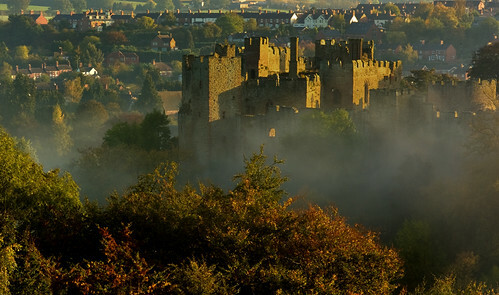 As Arthur was Prince of Wales the couple headed for Ludlow from where Arthur was head of the Council in charge of Wales. It was in Ludlow that Arthur died in 1501, possibly of tuberculosis or from ‘sweating sickness’ a mysterious and feared illness of the day. The body lay in state in Ludlow for three weeks before being moved for burial. Catherines family had been a little reluctant to allow the marriage because of fears about the possible overthrow of Henry by rival claimants. However, after such a short marriage they felt justified in asking for the dowry back. Henry VII was reluctant to comply and instead played a game of cat and mouse with her parents, not wanting to return her but not wanting to actually marry her to his second son Henry. 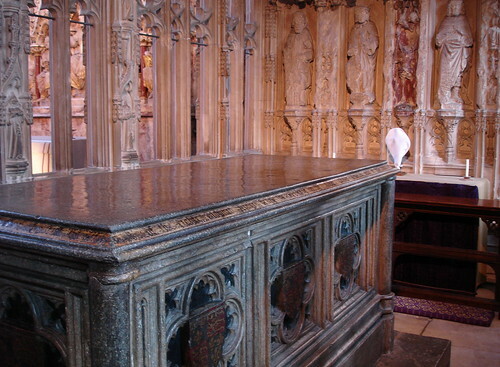 Arthur was taken to be buried at Worcester Cathedral where his ornate tomb stands to this day. Prince Arthur’s Chantry is an ornate addition to the Cathedral, and is sited to the right of the Altar. The step leading into the chantry has been worn smooth over the years – it is strange to stand here and imagine that previously Queen Elizabeth the first also passed by here – she is known to have visited the tomb during one of her Royal progressions through Worcestershire. 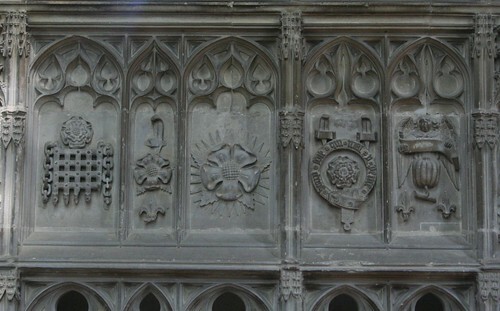 The chantry is decorated with carvings of the Tudor rose – note also the pomegranate which is the heraldic symbol of Catherine of Aragon. I suspect (but am not sure) that this would have originally been painted, if anyone knows it would be great to hear from you. The Chantry at Worcester was seriously damaged during the time of King Edward VI. Many churches suffered at the hands of iconoclasts who believed that reverence for physical objects was akin to ‘idolatory’. 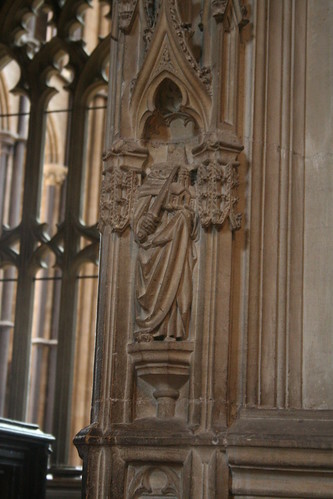 During this period mass books, priests vestments and carved images such as crosses and saints figures were deliberately vandalised. It was during this period that English churches acquired their stripped down and uncluttered appearance that has largely survived to this day. 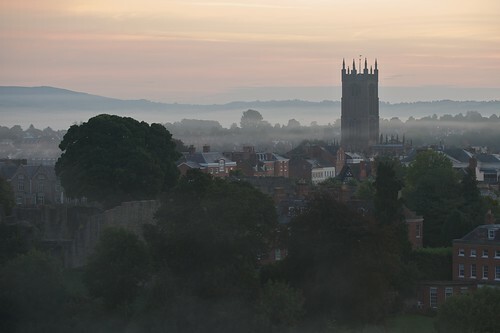 The Cathedral overlooks the river Severn in the heart of Worcester. Building commenced in around 1084, over the years the Cathedral has been through many stages of development and features a range of building styles. Worcester is particularly proud of its choir – I was lucky enough to be there one day when they were practising and it is hard to describe just how wonderful this sounded. If you ever get the chance then you must visit the cathedral – in the meantime, take a look at this video which will give you an idea of what it is like. 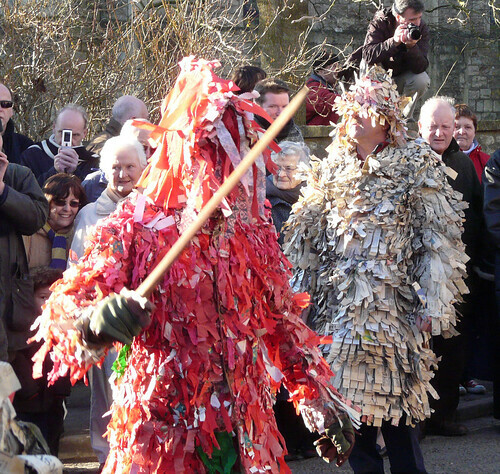 PS Events have conspired to hinder my usual blogging activities – I hope to get back on track over the next few weeks. Meet the Cleves : Anna and her sisters? Whilst doing a bit of research for another post I found out a little more about Anne of Cleves. Anne is well known to us because of the famous Holbein portrait, she is also remembered because of Henry VIII’s famously negative reaction to her. Born on the 22nd September 1515, Anne was the second daughter of Johann (or John) III – known as ‘the peaceful’. John ruled the duchy of Juliers-Cleves an independent part of the Holy Roman Empire and a territory he partly inherited and partly acquired through marriage to his wife Maria. Although she came from a relatively small territory, Anne had an impeccable royal lineage – she was descended from Edward I of England and John II of France. 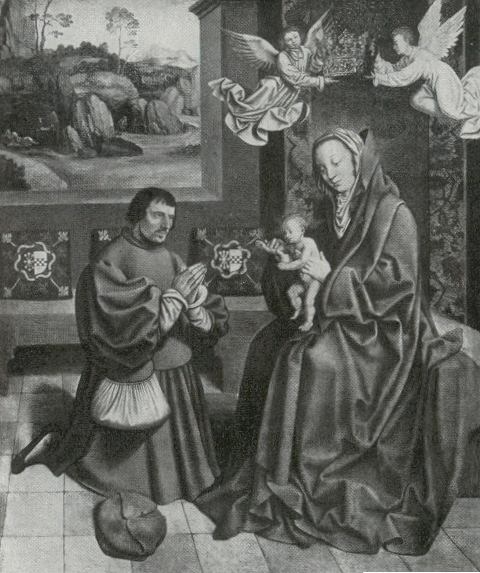 Anne was the second of four children, her oldest sister Sybille was born in 1512 (top of post on the right) William, born in 1516 who succeded his father as Duke (pictured below) and Amelia (pictured top of post in the middle/rear). The next bit is trivial, superficial and trashy! Look at the pictures above – don’t you think that they are a fine looking bunch of people?History has arguably been a little unkind to Anne – the famous ‘Flanders Mare’ jibe was not in fact uttered by Henry VIII. This was actually made by the historian Bishop Gilbert Burnet writing in the 17th Century. Gilbert Burnet historian, bishop & lets be honest here - no right to criticise anyone about their physical appearance!